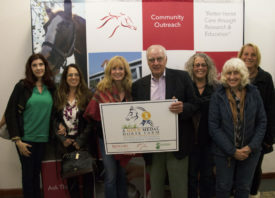 Share the post "Equine Science Center Hosts “Evening of Science and Celebration”"
Former Governor and current New Jersey State Senator Richard J. Codey (left) and Rutgers Equine Science Center founding director Karyn Malinowski (right), present the 2019 “Spirit of the Horse Award” to Kennis “Buttons” Fairfax (center). 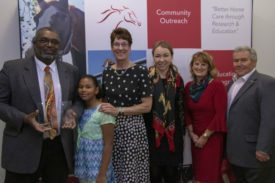 (From left to right) Kennis “Buttons” Fairfax with his daughter Tatiana, and Rutgers Equine Science Center staff and board Members Karyn Malinowski, Amy Butewicz, Carey Williams, and Warren Zimmerman. The Rutgers Equine Science Center hosted its 2018 “Evening of Science & Celebration” on Thursday, November 8 in New Brunswick, NJ. Sponsored by Mid-Atlantic Equine Medical Center, this year honored Kennis “Buttons” Fairfax, a renowned horses show judge and clinician from Westfield, NJ. 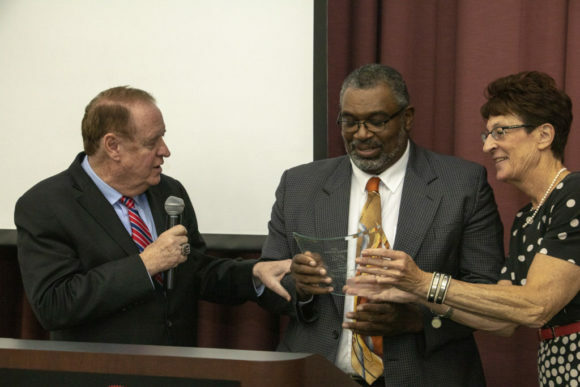 Kennis received the 2019 “Spirit of the Horse Award” for his lifelong commitment to advancing the proper care and management of horses, and for his contributions to youth education. 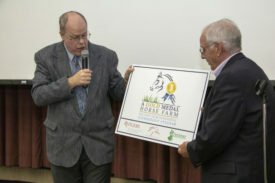 Michael Westendorf, extension specialist and professor in the Rutgers University Department of Animal Sciences, presents the 2019 Gold Medal Horse Farm award to Mortonhouse Farm owner, John Crater. The award and this overall program give recognition to outstanding equine farms for their dedication to environmental sustainability and management. It also underscores the efforts of the New Jersey equine industry to maintain the beauty of the Garden State. 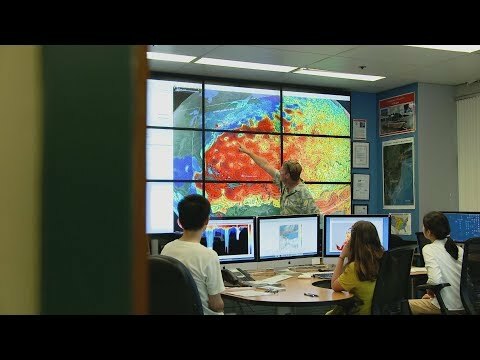 The program is a collaborative initiative by the New Jersey Agricultural Experiment Station at Rutgers University (NJAES), the Rutgers Equine Science Center, and the New Jersey Department of Agriculture (NJDA). Mortonhouse Farm joins Dorsett Arabians (2017), Hidden Hills Farms (2016), Lord Stirling Stables (2015), Woodhollow Farm (2014), D’Arrigo Racing Stable LLC (2013) and Showplace Farms (2012) as the state’s only Gold Medal Horse Farms. Any farm owners interested in applying for next year’s award may access the application on the Equine Science Center website.